The first Fire Hall was on Sanders Street, in the early 1930's The actual date of building is unknown. It burned down in 1943. The fire broke out on a Thursday morning and completely destroyed the fire hall and the fire engine and equipment that were inside the building. By the time the firefighters got to the fire, it was to late to save the firehall. Ironically, a new 1942 Ford sedan belonging to the fire chief, Mr. Bev Adams, as also lost in the fire. What might have been a serious fire occurred on Wednesday evening at the old boarding house, when the chimney gave out and fire started in the roof. The efforts of some of the members of the Volunteer Fire Department were successful and the old landmark was saved. In the old days it would appear the builders thought that clay was a good substitute for mortar in chimney construction26. A new Firehall was built in 1948. A great deal of the funds to build the new fire hall were raised by events such as the Annual Firemen¹s Klondike Night held at the Community Hall. When the new fire hall was built, the alarm panel that had served as a temporary warning system was moved into the new fire hall. This fire panel is now located at the Wells Museum, and serves as a reminder of the early fire fighting days in Wells. In case of a fire the public was asked to phone in an alarm to the local telegraph office and the operators there would immediately get in touch with Chief Adams or another member of the fire brigade27. 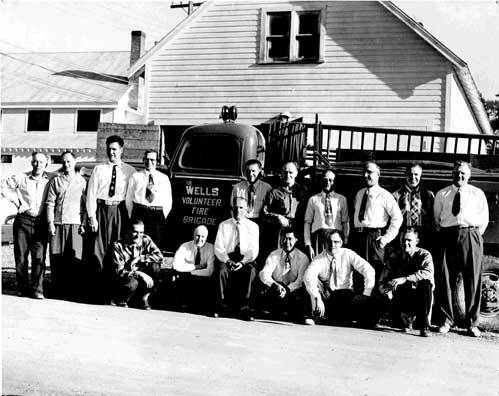 The Wells Volunteer Fire Brigade still operates today from the second firehall, behind the Wells Community Hall and is operated by local volunteers from the community.